Although the cause of baby acne is unknown, there are some things that can irritate your baby’s skin and make existing acne more noticeable. It is important to understand what can trigger baby acne and how you can help manage it. Baby acne is common and can occur right after birth or after a couple of weeks. It is most likely to appear on your baby’s cheeks, forehead and chin as small whiteheads sometimes surrounded by red skin. There is no definite cause of baby acne, though it might be the result of hormones in the mother at the end of pregnancy. Breast milk can cause your baby’s acne to become more pronounced. If your baby spits up milk after a feeding, you might notice more acne around his mouth. The same thing can occur if his skin is irritated by saliva, or if he is overheated or fussy. Certain medications that you take while nursing can cause your baby to have acne. If you are taking any medications while breastfeeding, be sure to tell your doctor. If the medication is safe and not causing you or your baby any harm, you might be able to continue taking it. Baby acne is harmless and typically does not bother babies. Baby acne clears up on its own, a process that can take a few weeks or a few months. 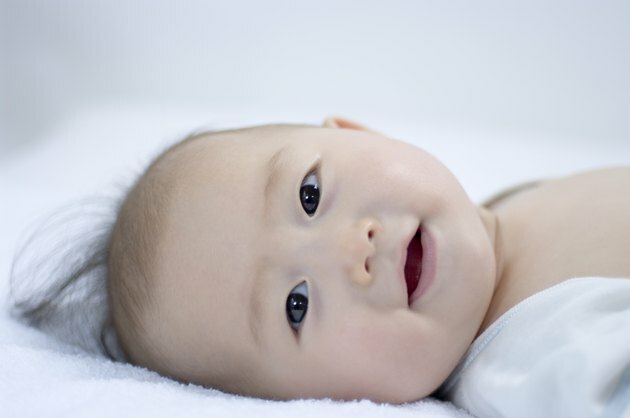 If it does not clear up after three months, consult your baby's pediatrician. Avoid applying creams or oils to your baby’s skin, which can make acne worse. Cleanse her skin gently without scrubbing once a day, and pat her skin dry. If your baby’s acne is scaly and resembles a rash, he might have another condition, such as eczema. Your baby’s doctor can offer specific advice on how to manage eczema, so be sure to discuss the symptoms with her.